For a relaxing holiday with friends or family, this lovingly restored, traditional villa with private pool in a rural location is ideal. Beyond the tourist trails you will experience the original Algarve and reach the capital Faro, beautiful beaches and the exclusive tourist centers of Quinta do Lago and Vale do Lobo after about 10-20 minutes drive. Arrival in July or August only from Saturday to Saturday. Flexible during the main season. On a floor space of approximately 170 square meters, the villa has 3 features, 5 bedrooms and 3 bathrooms (2 en-suite) for max. 6 adults and 1 child. The kitchen is fully equipped to prepare your meals. About the tastefully furnished living and dining room (seating for 8 people) you can reach the terrace with large dining table and a picturesque view of the nature and the sea on the horizon. The beautiful Mediterranean garden with oleander bushes, fruit and olive trees you reach for children fenced, private 4x10 m swimming pool (heated for a fee) with sitting area, another dining table, chairs and parasol. The villa has gas central heating for the cooler winter months and a fireplace in the living room. The villa is suitable for families with children (fenced pool, high chair and travel cot is available). 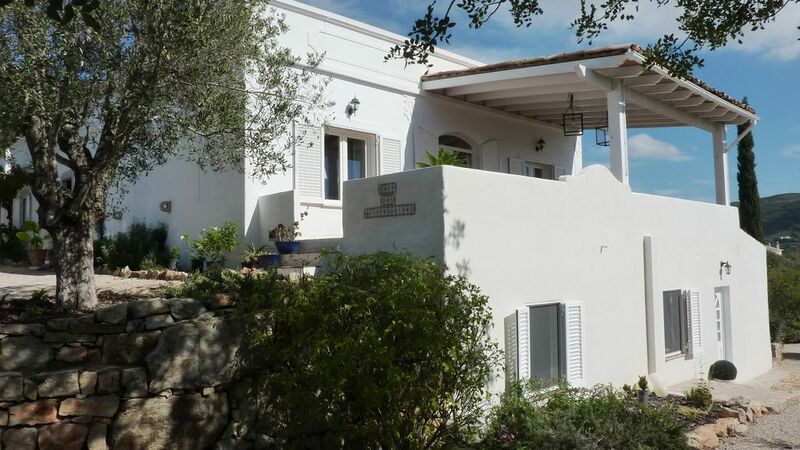 The beautifully designed villa is situated in a gorgeous surroundings, in an area close to Faro. We were 5 adults and two kids , enjoying all the commodities in the house,that is perfectly equipped and organized. A private pool surrounded by a beautiful garden , (absence of any noise or neighbours, creating complete privacy and comfort) , wide terrase with the view , barbecue area around the pool, tasty fig trees and good weather, made our stay fabulous. All the information about the beaches, supermarkets and other amenities were kindly provided by the owners . We definitely recommend the house and will be back soon! Der Pool Bereich ist einfach herrlich. Die Villa ist toll ausgestattet und bietet draußen zahrleiche schöne Ecken zum Essen und entspannen. Wir haben hier zwei perfekte Wochen verbracht. Das Haus lässt keine Wünsche offen, sehr großzügig. Es gibt mehrere Plätzchen um draußen zu sitzen und den Blick zu genießen. Schön angelegter Pool mit ausreichend Schattenspendern. Man ist sehr schnell an den unterschiedlichen Srrandmöglichkeiten. Heidi war für uns immer ansprechbar und hat uns ganz toll bei der ein oder anderen Sache geholfen ! Wir kommen gerne nochmal wieder ! Fantastic villa arranged with a lot of gusto. Everything you need for a lovely holiday.